The cast of Kitchen Witches, the latest production from the Leduc Drama Society, are ready and raring to stir up some tricks and treats for anyone lucky enough to have obtained a ticket! Photo graciously supplied by Harold Schoonmaker. 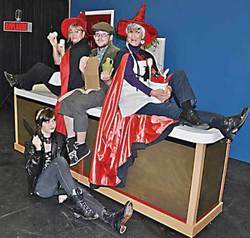 The Leduc Drama Society's latest production titled "Kitchen Witches" is truly a treat for the senses! One of the smallest ensembles they have ever put into production with only four cast members on stage, it just goes to show you do not need quantity to achieve quality. Having been lucky enough to have been in the audience for a number of LDS productions over the years, I will go out on a limb to say that this is, overall, probably the BEST show I have seen them bring forth. It is smart, funny, human, and treats its characters like real people. Focusing on three main characters; Dolly Biddle, aka Babcha, played by Mary Ellen Shimell, Dolly's son Stephen Biddle played by Curtis Johnson, and Isobel Lomax played by Marlene Schoonmaker, the plot makes many twists and turns as the story unfolds, with a few big surprises strewn throughout the tale instead of bomb shelling the audience all at once at the end, which encourages the audience to invest a lot more of their emotions into the characters. This is also the first time that Director Marion Brenner has worked with LDS on a production. Haling from Edmonton with a string of credentials behind her, she has not micro-managed her cast regarding every facial expression and hand movement they use, allowing the actors to blend some of their own emotions, interpretations and gestures into the roles which makes the characters even more believable and likeable. We are first introduced to Stephen Biddle (Curtis) as he, in his role as producer, is readying the small audience at their local cable station to view the filming of the final "Baking With Babcha" show, which is hosted by his mother Dolly, aka Babcha (Mary Ellen). It does not take long for the hilarity to ensue as Babcha interacts with her small and familiar audience noting them by name, ensuring the quality of her ingredients as she bakes up a dish requiring liquor, and then has her final show crashed by her nemesis Isobel Lomax (Marlene). Once the two ladies start scrapping while the cameras are still rolling and air out some of their dirty laundry on TV the final show is a hit and the two enemies are offered a new show if they will agree to be co-hosts. Hence, after the new show goes through many different incarnations in regard to the name the two women finally agree on the title "Kitchen Witches". With insults and scandalous gossip served up alongside of home baked goodies, Kitchen Witches becomes an instant hit on the cable access channel but poor Stephen gets caught in the middle trying to put on a weekly show hosted by two women who hate each other. Mary Ellen, who plays the character Dolly/Babcha, is an absolute gem in an apron! She just recently moved to Leduc from B.C. and thankfully decided to share her acting talents with us. Involved with community theatre for years she portrays Dolly/Babcha to a "T". Even down to an excellently outrageous middle eastern accent that comes and goes at will. Marlene on the other hand, has been a staple at LDS for years and she gets to show exactly why she has had such staying power in this production. Playing Isobel, she is given the opportunity to portray a women who has harboured a terrible grudge for 30 years and because of this behaves like the quintessential B-word toward a former friend, but when things come down to brass tacks she exposes the hurt that caused the anger so many years ago in such a way that you really come to understand and feel for her character. Curtis's character Stephen is a very typical young man caught between two strong female personalities, one being his mother, only to find his loyalties divided by some earth shattering news. He then attempts to remain fair while struggling with this news, the love for his mother, and the stresses of his job. Curtis does a fantastic job of portraying a young guy stressed to the breaking point while still managing to remain funny. All of these machinations take place on top of a very simple set that works incredibly well in moving the show forward as well as keeping your attention focused on the actors. Classic rock/pop songs are played during scene changes that will keep the audience engaged and probably singing along as well. As much as I would love to, I am not going to give away any hints on the plot twists or drop dead funny lines that come spewing out of the characters mouths but trust me when I say that you really do want to see this play! So with only three show times at the Maclab Theatre before they take the play on a four location dinner tour, do NOT wait to get your tickets! Showings are on Friday and Saturday November 1&2 at 7:30pm and finally on Sunday November 3 at 2:00pm. Tickets are only $16.00 each and can be purchased at the door or at Black Gold Galleries in Leduc located at 4724-50 Ave. But as a special offer for Pipestone Flyer readers only, there is an opportunity to win two free tickets to Kitchen Witches Saturday night performance! If you can name the Director of Kitchen Witches (hint: you can find it in the above story!) and are the first person to call me at 780-232-4131 with the correct answer, you will win the tickets! Good luck to all and the winners will be everyone who makes it out to this fabulous production!